Just as the New York trip last year was a part of the bucket list for my mom and sisters, Québec was a part of my own bucket list. As this trip served as my anniversary trip with my wife, I was very much looking forward to it. Québec is the only walled city north of Mexico, and Old Québec is a UNESCO World Heritage Site. It lies on the banks of the St. Lawrence River, across from Lévis. The Provintial Capital of Québec in the heart of Francophone Canada, only 1.5% speak English reportedly as of 2007. Which was a great opportunity for both my wife and I to practice our French with other people. Something we seriously miss out on in Central Illinois. We woke up, and immediately went to Old Québec. 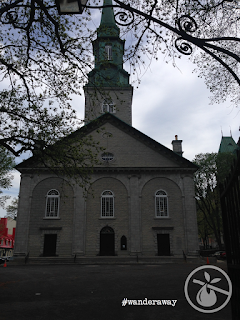 Our hotel (Delta Marriott Québec) was only a few blocks away, so it was a quick walk. Once we got into the old city, we found a cute little café called Nili Alimentation. It is one of those small places that does not have an Internet presence. We ordered our coffees and breakfasts. The food hit the spot, but the espresso was under-extracted. When I come back to Québec, this will not be high up on my places to re-visit. After coffee, we started our exploration. Our first main stop was the Anglican cathedral of the Holy Trinity. This has the honour of being the first Anglican cathedral built outside of the British Isles. It was exactly what I love about High Church Anglicans. Right as you enter the nave, the beautiful stained glass icon of the Ascension imposes your view behind the alter. The architecture draws your eyes upwards towards the heavens, and there is the unutterable name of God written above. Commissioned by King George III (the same king the US rebelled against and gained our independence from), and thus has his coat of arms on the Royal Pew, there is an exhibit showing the gifts given to the cathedral from the king, and other members of the Royal Family, such as a Bible, a Book of Common Prayer, communion chalices, and more. As Québec is French, there are bound to be more Catholics than Anglicans. 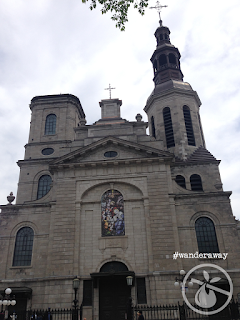 Therefore, our next stop was the Cathedral-Basilica of Our Lady (Notre Dame) of Québec. Immediately, your eyes catch the golden cherubs arching upwards towards the Resurrected Christ. Along the sides of the nave are smaller chapels dedicated to various saints. Also, there is the grave of St. François de Laval, the first bishop of Québec. 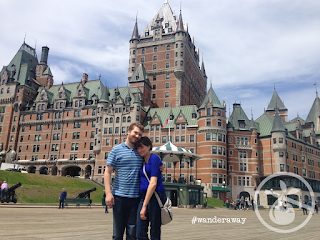 No trip to Québec is complete without the customary visit to the Château Frontenac. This hotel dominates the Québec skyline, and is its most iconic building. Now owned and operated by the Fairmont Hotels and Resorts chain, it has its history as a "grand railway hotel," a 5-star hotel for rail passengers. It is named after Louis de Buade, Count of Frontenac, a governor of New France and leader against the English and Iroquois armies during the Nine Years' War. The boardwalk running in front of the hotel is a popular place to take pictures. Not only can you get photogenic shots of the hotel, but you can also get lovely shots of the river. After taking more than a few pictures, we went inside to the hotel bar and ordered a round of drinks. While I got to fulfil a dream of ordering a drink there, I still need to stay there as a guest. We bought a quick lunch from a small grocery store called Epicerie Richard (no website), and walked towards the Citadel. It is the oldest military building in Canada, and it is still operational. Admission to the Citadelle and museum is $16 for an adult, and if you arrive before 10 AM (in the summertime) you can witness the changing of the guard. As the fort is still an operational military base, all admissions to the fort are guided. After going to the Citadelle, we visited two bookstores: Librairie Pantoute, and Librairie St-Jean-Baptiste, where we bought French versions of The Hobbit (Le Hobbit, note: not L'Hobbit) and The Lord of the Rings (Le Seigneur des anneaux). Then we went back to our hotel room to freshen up before dinner. For dinner we chose Pub Galway, a wonderful little Irish Pub. She wanted poutine, but I wanted sausage. How we ended up getting 0 Irish food in an Irish pub is besides me, but, whatever. It happened. And it was tasty. Highly recommend. 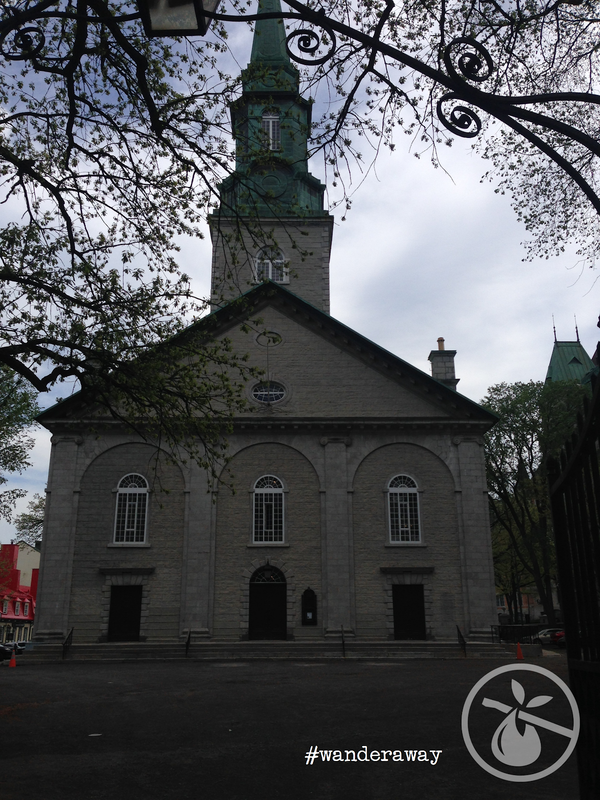 The next day, we woke up, went to Orthodox Liturgy (in a basement of a Catholic church), and then left to Montréal. I absolutely fell in love with Québec. I will absolutely come back to spend more time. Not only explore more of the Old City, but also a lot of the new. I am not a fan of snow, but I will have to come see the charm of the Old City during winter that I keep hearing about.